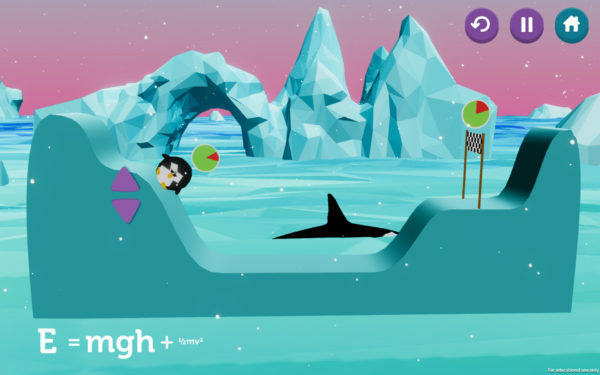 Have you ever dreamed about learning physics concepts simply by playing with penguins? At ScienceAtHome we believe that students learning through games will become better contributors to citizen science. That’s why we are constantly working on developing and improving games through which users can learn about the theories of physics simply by playing. The Potential Penguin game is now available for Windows and Mac. Download and try it here! Game-based education raises the interest of the students and increases interactivity, entertainment, and intuition. It also improves acquisitive, organizational, creative and manipulative skills. 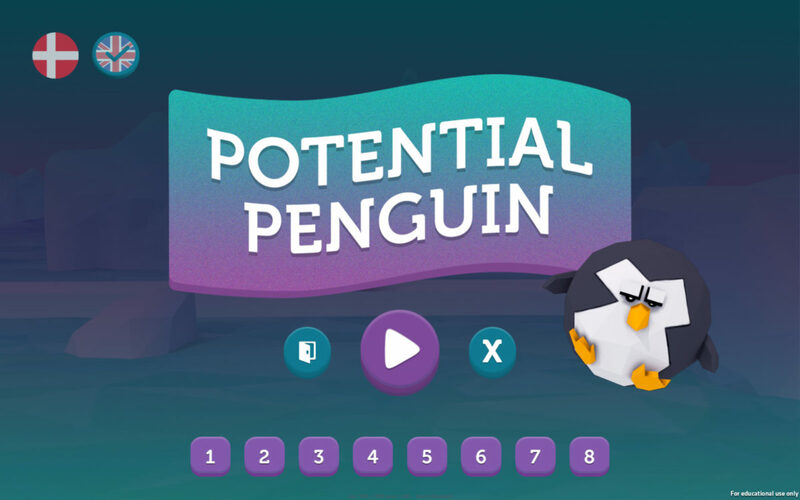 In the Potential Penguin game, you explore and learn the connection between potential and kinetic energy. By changing the landscape you control the potential energy of a penguin and see how this translates to the penguin’s motion—in other words, kinetic energy. Potential and kinetic energy – the energies associated with position and movement, respectively – are fundamental concepts in classical physics. Traditionally, when high school students are introduced to potential and kinetic energy, they are presented with the analytical expressions and have to work through a couple of simplified problems. 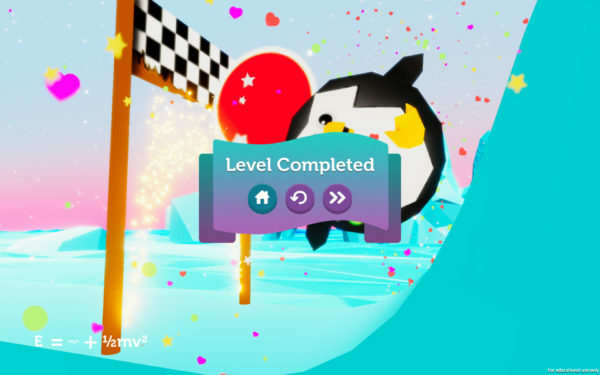 In the learning game, Potential Penguin, the players are introduced to these fundamental concepts and their inter-dependencies through a puzzle game where they can intuitively manipulate the environment and observe the changes. The game consists of a penguin, sliding on ice hills. The goal of the game is to slide the penguin with just enough speed to steer it to its desired destination. The player can manipulate the height of hills, thus changing the kinetic and potential energy while the penguin is reaching towards the finish line. As the penguin slides downhill the potential energy is converted into kinetic energy: it gains speed! It applies the other way around as well. If the penguin slides uphill, it loses speed. This way, the players are in full control of the penguin’s movement by correctly manipulating the height of the hills. 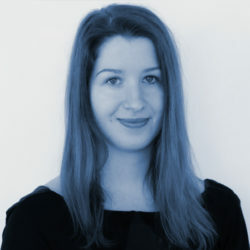 While the players are intuitively controlling the environment, science theory is also included. In order to connect classical physics concepts and visualize the more theoretically oriented learning content, the mathematical expressions for the potential and kinetic energy are displayed with dynamically changing font size, reflecting the amount of energy at any given moment. To learn more about the Potential Penguin and other ScienceAtHome projects visit us at the Science in Forum (23-25 April, Copenhagen, Denmark) or check the info on our website. Also, if you are curious about the old version of Potential Penguin, check out this video! The new Potential Penguin will be available for our players very soon!! With a penguin avatar, you really should publish a Linux version.